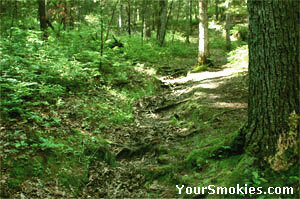 When you leave the Cable Mill historic area you will turn onto a gravel road on your right which is Forge Creek Road. While there were a several homesteads at one point on this road, there is only one left - the Henry Whitehead Place. Before Forge Creek road ends at the Gregory ridge trail trailhead, there is a bridge on the right that where Parson Branch Road begins. At one time Parsons Branch Road was one of the major thoroughfares in Cades Cove which resident of Cades Cove would take to get to North Carolina. Parsons Branch road was closed for 4 years due to washouts and flooding but has just reopened and is better than ever. If you take this road you will end up on the tail of the Dragon (129) and there is no way to get back to Cades Cove. Parson Branch Road in Cades Cove TN is Closed due to downed trees. 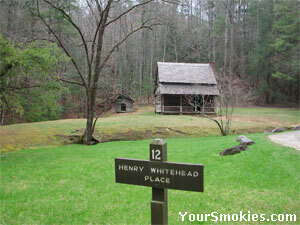 About halfway down Forge Creek road you will find the Henry Whitehead Place homestead on the left hand side of the road. Before leaving your car, look around as I have seen red fox no less than 6 times on the grass near the cabin. I have also had numerous coyote and red fox sightings in the filed that is on both sides where you turned onto Parson Branch Road. 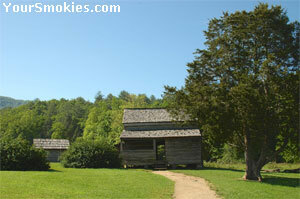 Besides the wild life around the Henry Whitehead place, there are 2 other interesting aspects about this homestead that make it worth the detour from the main Cades Cove loop: the first is the architecture of both of the main buildings and the second is the family saga surrounding these 2 cabins. At first glance it may look as though there is only one cabin but a closer look reveals that the original cabin built in 1880s is sitting behind the newer cabin. The original cabin was built by Matilda Shields Gregory's brothers after her husband deserted her and her young son. All was not lost for Matilda though as the widower Henry Whitehead who had three daughters and lived in Cades Cove courted and then married Matilda Shields Gregory. Since the original cabin was too small for such a large family, Henry Whitehead decided to build the cabin now located in front of the original cabin. 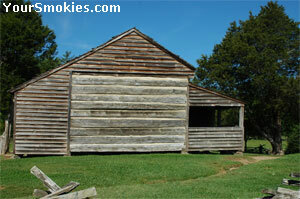 This cabin is extremely well constructed with 4 inch thick walls and is actually a transition house which was one of three that were located in Cades Cove. A transition house is a house that may first appear to be a frame house but is actually made from logs that are squared typified by the jointed corners. Transition houses could not be built until there were saw mills could square cut the log. Obviously it made sense to not have to transport such large logs great distances so the saw mills had to be located near when the construction was to take place. 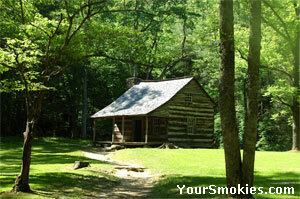 These 2 cabins are considered to be the finest examples of log construction in the Smoky Mountains. Sadly two other outstanding large Sawed Log transitional houses on Forge Creek by Frederick Shields and James V Cable were never preserved and no longer exist. We should be all thankful for the fact that the national park service is not only striving to persevere native plants and animals, but the history and culture of an area as well. Henry Whitehead Place on Forge Creek Road. Henry Whitehead homestead built in the 1880s. Cades Cove nature trail is short yet peaceful. 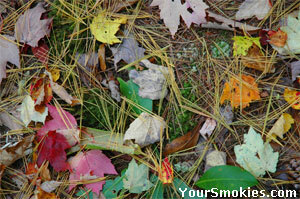 Variety of plants on the Cades Cove nature trail. Have about 30 minutes to spend walking through a dry forest with a slight grade? The Cades Cove nature trail is perfect for you especially for those that can not handle a very long hike or have kids that need some wearing out. The Great Smoky Mountains association has a pamphlet that is well worth the cost and gives a great explanation of the how the pioneers used various natural materials found in the cove as well as where to see these raw materials on the trail. We are now at the south end of Hyatt Lane. If you wish you can circle that back area of the driving tour stops 7 through 12 by making a left onto Hyatt Lane and driving north until you hit the north end of the Cades Cove driving loop. The Dan Lawson house was built from hand hewn logs in 1856. The land where this homestead stand was purchased from Peter Cable a relative of John P Cable who later own built the grist and saw mill. The collection of buildings here includes the main cabin, a granary which is the building closet to the house as well as a smokehouse. There are some interesting facts about the main Lawson house. The first is that the chimney is made from brick which was rather unusual for a house built in the 1850s in Cades Cove or the surrounding Tennessee and North Carolina area. These bricks were actually made from materials from this property. The next is the obvious additions that were made latter on using lumber that were sawed at the local saw mill. Historians have even found when examining this building carefully that some repairs made to the original hewn lumber were made at the new saw mill. Dan Lawson did quite well or himself acquiring land that ran from the North Carolina and Tennessee border on the mountain crest behind the homestead which is south, all down the mountain to the homestead, all the way across the Cades Cove valley floor and then north to the top of Cades Cove Mountain. Dan Lawson homestead and the smokehouse. 1856 Dan Lawson cabin showing latter additions. Colonel Hamp Tipton was another veteran who served this country who lived in Cades Cove was active in the Mexican American war. Although Col Tipton owned property in Cades Cove he lived in Tuckaleechee Cove (now called Townsend) but in the 1870s he decided to have this house built. The two most notable groups of people who lived here were his daughters and the McCaulley family. His daughters were school teachers who taught in Cades Cove and went by the names Miss Lizzie and Miss Lucy. The McCauley family was headed by James McCaulley who rented this homestead for a while in the late 1870s before he could afford his own place. James McCauley was a hardworking man who had great skill in working with his hands. He used to use the blacksmith shop by the hollows until he was later on able to purchase land and build his own blacksmith shop and carpentry shop. The long shed you see on this property used to house bee gums. There is also a smokehouse and a wood shed in the front of the property and across the road to the north you will see a double pen corn crib and a beautiful replica of a cantilever barn which once stood here. Side view of the Tipton Place built in late 1870s. Cantilever style barn & horse drawn wagon. Carter Shields 1910 cabin nestled by the woods. This barn blew down bottom of a steep hill was this sturdy barn. 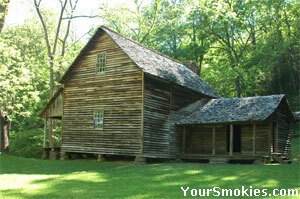 The last cabin on the Cades Cove driving tour is the Carter Shields cabin. George Washington Carter Shields was from Cades Cove but like many men in the civil war found himself taken from his home town fighting fellow Americans in far way places. In April of 1862 he fought in the infamous Battle of Shiloh where he was seriously wounded and became crippled for life. George Washington Carter Shields married shortly after the war and left his home in Cades Cove Tennessee with his wife and moved to Kansas where he lived until 1906. 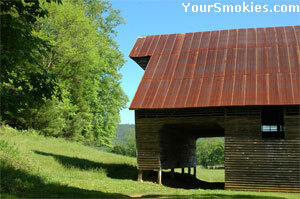 In 1906 George Washington Carter Shields returned to Cades Cove and bought this property in 1910. 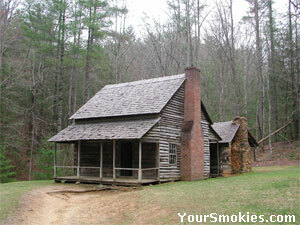 He did not stay long here however and moved away in 1921 leaving the wonderful spot in cades Cove. In my opinion this cabin is one of the most picturesque spots in Cades Cove and is a delight to see in the winter with a light dusting of snow, in the spring when the dogwoods around the cabin and the wildflowers boom and in the fall with the riot of colors in the woods behind it. Our final designated stop is the south end of Sparks Lane. If you wish to drive the Loop again - especially if you are interested in sighting animals in the fields, take Sparks Lane north until you hit the west bound Cades Cove Loop. Remember you don't have to repeat the entire loop, you can use Hyatt lane to bypass the last 1/3rd of the Cades Cove Driving tour.